Better than a 7, but not an 8. It’s serviceable. Pros: It’s not “Noah,” which was such a heretical, convoluted, fighting-rocks mess that I nearly exited stage right after 35 minutes. 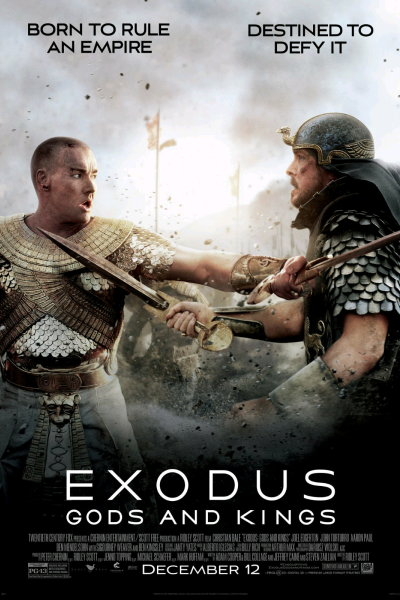 Cons: Exodus starts well, does a nice job developing a few key characters, and them blammo, two things go wrong. First, God-as-burning-bush’s messenger (the theophany, “Malak”) appears, at times, as if he’s shifty, or making things up as he goes, or that he’s confused, or that he’s really negotiable. And he’s kinda creepy. These are not traits one usually associates with God, who is positive, certain, all-knowing, constant, firm. Second, the final 40% of the film is way too rushed. It really needed another installment altogether (does the Biblical book not warrant the same treatment as Twilight, Divergent, or Hunger Games? ), or should have been extended 20 more minutes and edited as well as the first 60% of the film. Forgiving the man/boy/angel/bush/stacking-rocks problem, I was otherwise digging the movie’s character development…until it appeared that Ridley Scott ran out of time, money or interest to finish what he started. Frankly, I believe he lost heart—having lost his brother in 2012, one year before production began in earnest. Oh, and yes, I would have appreciated more ethnicity and diversity in the film, and don’t understand why there wasn’t more, but c’est la vie: this is 20th Century Fox we’re talking about, and with $140M at stake, “brand names” are the usual bet.